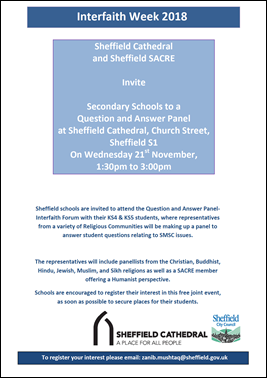 The Sheffield SACRE (Standing Advisory Council for Religious Education) is a statutory body which is constituted to provide advice in relation to religious education and collective worship, including convening a locally agreed syllabus. Each SACRE prepares an annual report to the National Association of Standing Advisory Councils on Religious Education. For more information about Sheffield SACRE, including access to the agreed syllabus, key documents and links to resources and organisations, use the links below. 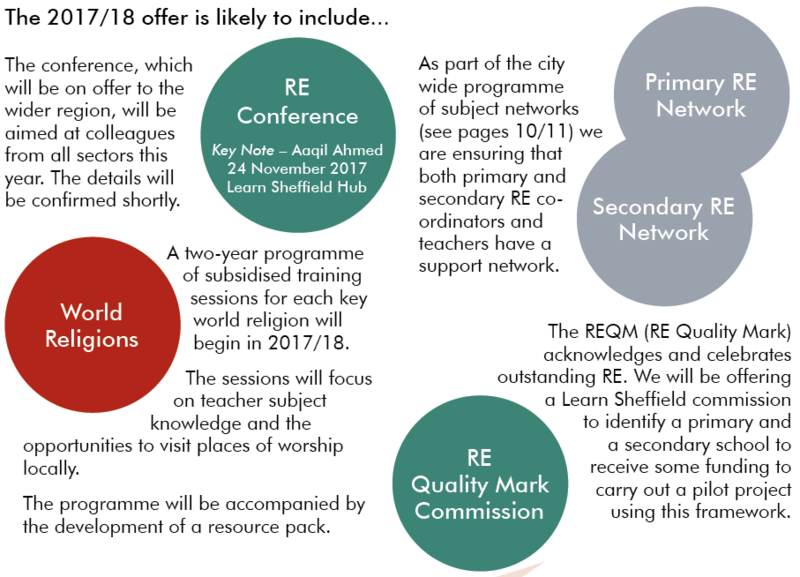 Learn Sheffield works closely with Sheffield SACRE and last year jointly organised two RE Conferences, one for primary and the other for secondary. In 2017/18 we will again make a joint offer to the city to ensure that RE professional development is available to Sheffield practitioners. To convene an Agreed Syllabus Conference to revise and recommend to us a local Agreed Syllabus for Religious Education (RE) for all maintained schools age 4 to 19 in Sheffield. 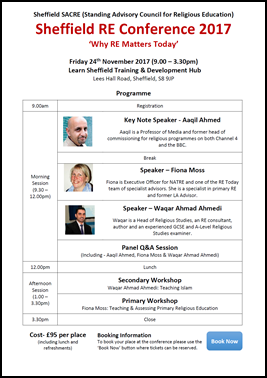 Monitor the provision of RE in Sheffield schools, preparing an annual report to us and the National Association of Standing Advisory Councils on Religious Education. Advise Sheffield schools on Collective worship and consider requests from Head teachers for a determination to lift the requirement for it to be in the main Christian. Support Community Cohesion within the city. SACRE meets three times each year, at various venues around the city. It is composed of four committees (see below) each with one vote with a casting vote held by the Chair. It may co-opt members from time to time who have no vote. The public has access to meetings, agendas and minutes. These can also be found on the Sheffield City Council website. This website is a resource whose key purpose is "to support pupils in developing their understanding of Christianity, as a contribution to their understanding of the world and their own experience within it." This website describes itself as a "toolkit for teaching about Christianity in RE". The RE:QUEST section contains secondary resources and the RE:START section contains resources for primary and SEN pupils. There is also a section for teachers. This website aims to "provide teachers with the resources necessary to teach accurate, high-quality lessons about Humanism and to assist them with the development of their own subject knowledge, in order that every young person has the opportunity to learn about Humanism". It contains a wealth of high quality resources for pupils at all key stages. EthosEducation.org publishes free resources for teachers to help students explore spiritual, moral, social and cultural issues through contemporary media. This includes a lot of free lesson plans for secondary pupils (see RELessonsOnline.com). Videos, lesson plans and assemblies for RE, PSHE and Citizenship (aimed at key stages 3 and 4). Schools can upload films and post comments, but everything is moderated before it appears on the site to ensure the content is appropriate. The website of an organisation that seeks to support the development of teaching about world religions. Of interest to teachers may be the annual calendar detailing religious festivals that they produce and also the advisory service and audio glossary available on their website. This free handbook is designed as a resource for teachers wishing to develop their subject and professional knowledge. A website "supporting school-based teachers in every part of their professional lives". It includes a wealth of material that covers policy, leadership, teaching, assessment and it even has a list of upcoming TV and Radio programmes that are relevant to RE. The Religious Education Council of England and Wales is an umbrella organisation for a large number of professional RE associations and faith and belief organisations. The website for the National Association of Standing Advisory Councils on RE (NASACRE) is a tool for designed for all involved in supporting RE through a SACRE. The outcome of a review of RE carried out by the REC. It produced a non-statutory national curriculum framework for RE to complement the new national curriculum programmes of study (2013) resulting from the DfE’s review of the school curriculum, (in which RE was not included). The Ofsted report published in 2013. A seminal report on the use of resource in RE. A report arising from the research and debate carried out by the Westminster Faith Debates and the Religion and Society Research programme which gave rise to them. This report is the outcome of a project undertaken "within the Religious Literacy Programme in the Faiths and Civil Society Unit at Goldsmiths, University of London. With funding from Culham St Gabriel’s Trust, an educational charity committed to excellence in RE, RE for REal examines future directions for teaching and learning in schools about religion and belief." A summary report produced by the APPG. "In September 2013 the Woolf Institute convened an independent commission to undertake over a two-year period the first systematic review of the role of religion and belief in the UK today and to make policy recommendations." This report is the outcome of that consultation.